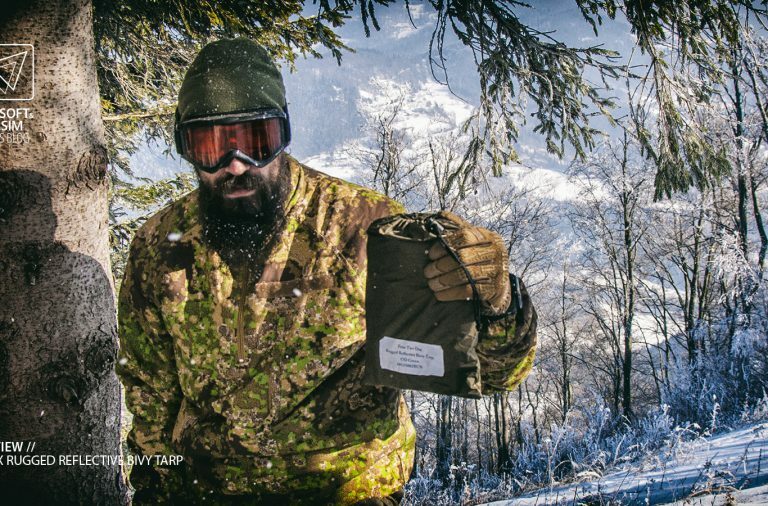 Welcome, to the part two of the ALPINE series of reviews. 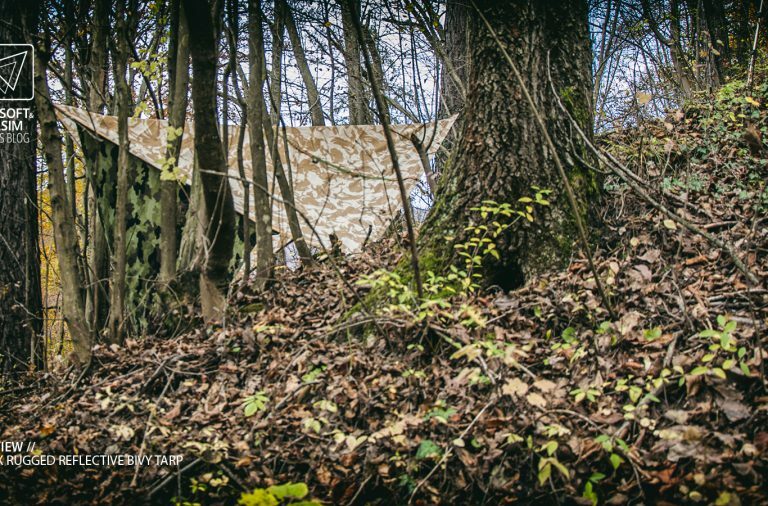 In this instalment, we’ll be taking a look at a Be-X reflective multi-function bivy tarp, made by outdoor and airsoft specialists at BEGADI, Germany. 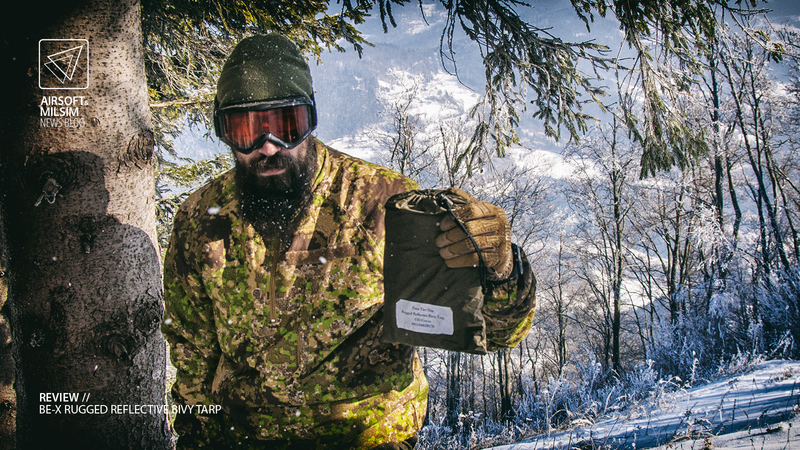 This tarp is a part of the Begadi Exclusive (Be-X) series, in which they offer top tier equipment. To be fair, this item is not just a tarp. It can serve multiple roles as you wander through the great outdoors. Because the staff at BEGADI know, anything can happen. 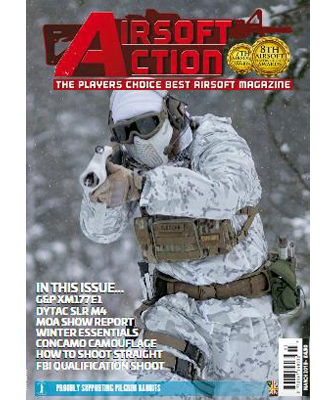 Ever since i first got my hands on an airsoft replica many years ago, i became familiar with BEGADI. A shop in our capital stocked their replica upgrade parts and some camouflage spray paint. After finally purchasing the items and trying them out, it became clear that the folks at BEGADI know what they are doing. 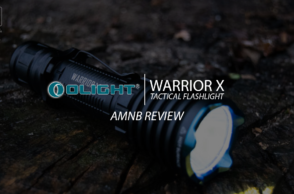 Committed to excellent quality and top notch customer service, the company grew and quickly became a go-to company, whenever you needed some hard use gear. 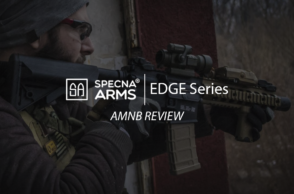 Their Be-X series takes that commitment, combines it with some user feedback mixes them in a bowl of their personal experience and what comes out is some serious, above mil-spec gear available to anyone. First thing i noticed when we got the tarp, was the size of the package. Usually other tarps in similar dimensions do not fold down as neatly. So we were off to a good start. 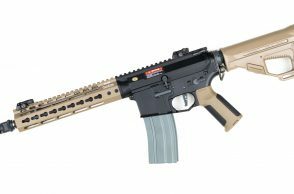 The weight itself is also lower than expected, especially when taking the word “Rugged” into account. 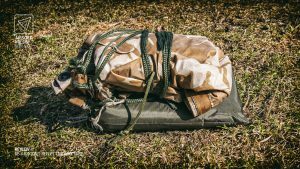 The tarp comes packed in it’s own storage bag, which is closed with some cord and secured with a cord lock. 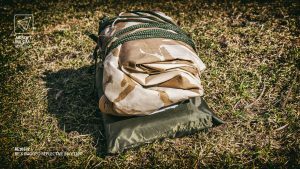 The dimensions of the bag are perfect, as once you take out the tarp, you can actually get it back in exactly the way it was. 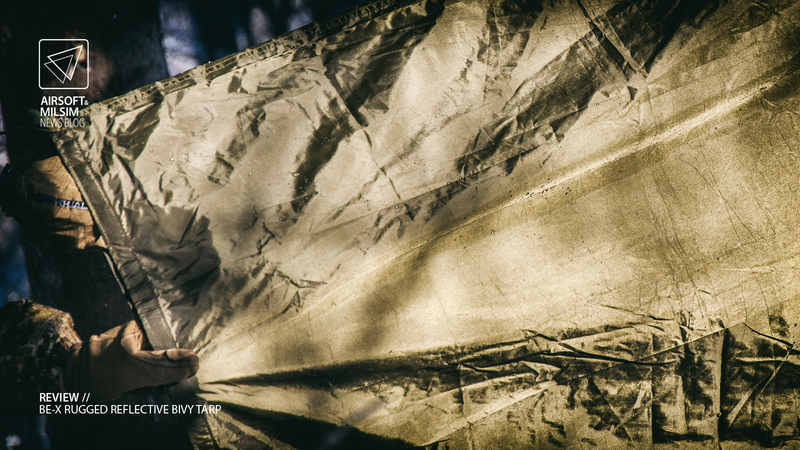 Upon handling the tarp, it soon became obvious, that we will have some fun with it. The material looks and feels sturdy, even though it’s light and thin. 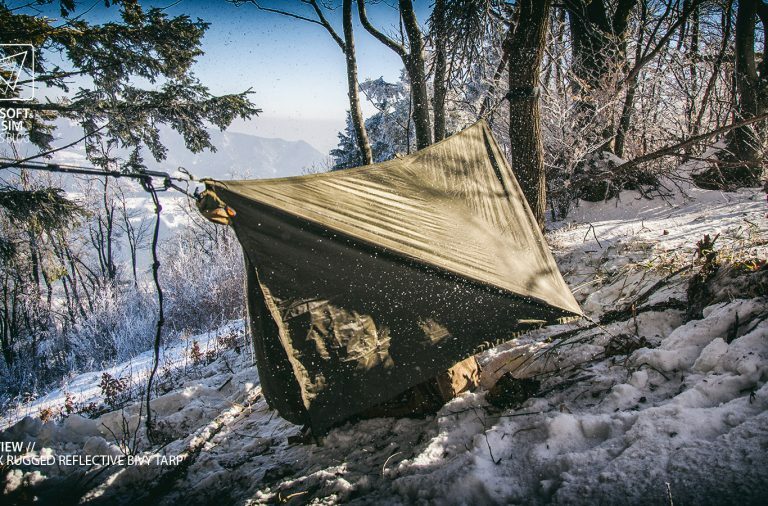 This particular tarp goes in the ultra-light shelter systems category and it stands up to it’s classification completely. It weighs approx. 560 g and it’s dimensions when laid out flat measure 240 x 195 cm. As mentioned, the pack size is significantly smaller than many of other tarps of similar dimensions. 28 x 20 x 4 cm to be exact. 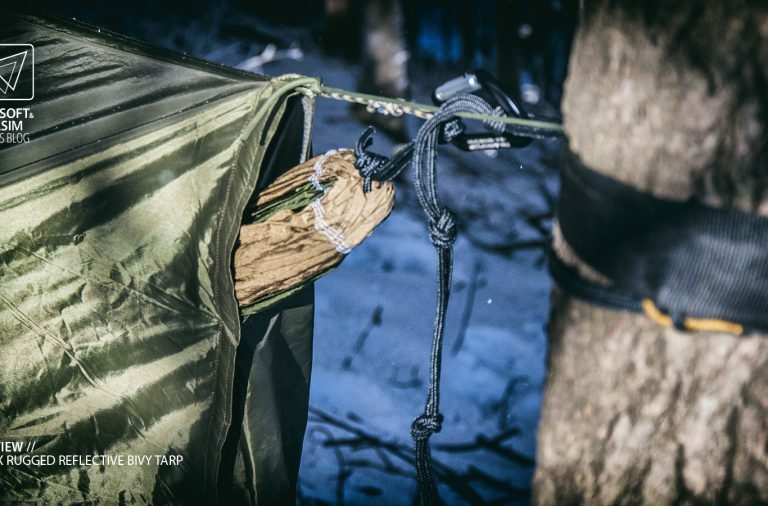 With 9 attachment loops, this tarp can be suspended in any way your heart desires and the reflective surface gave us a few ideas to try out. 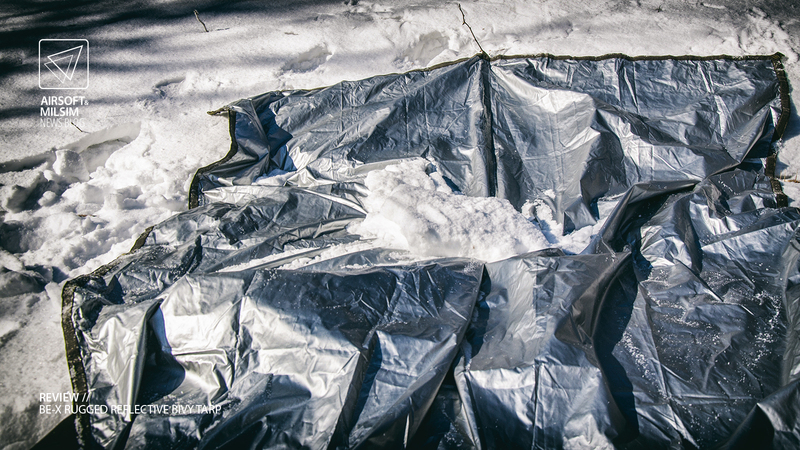 Combining the functions of a tarp and a space blanket was a great move. A hook and loop closure surrounds the outer edges. Half of the edge is lined with the hook side and the other half with the loop side. The strips are quite flexible and stick together very well. 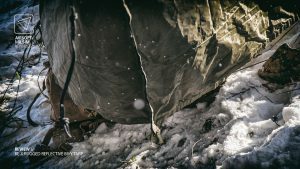 When the tarp is folded in half along the long way, these can be stuck together to create a bivy sack. 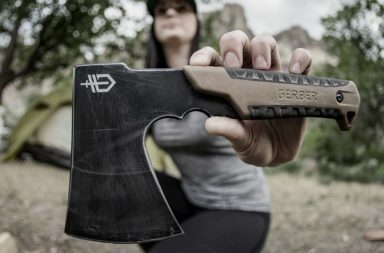 Easy to handle, they look like they can be used in a variety of other ways too. 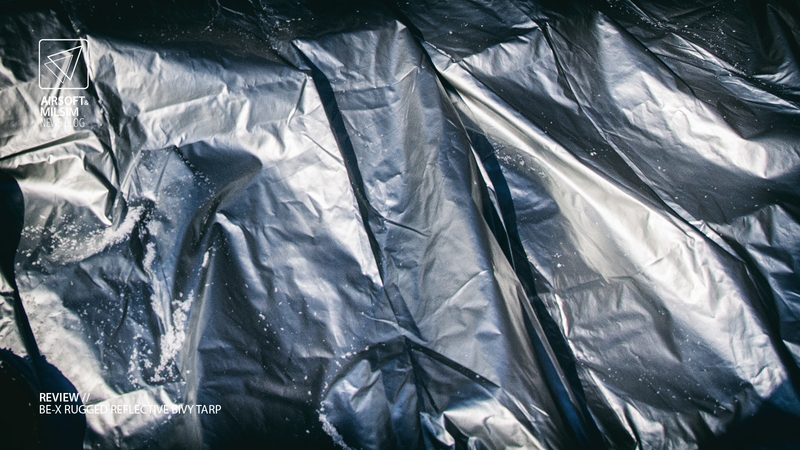 Construction material for this tarp is 100% Polyamide. On the outside, the material is coated with a waterproof finish and on the inside with a reflective silver coating. 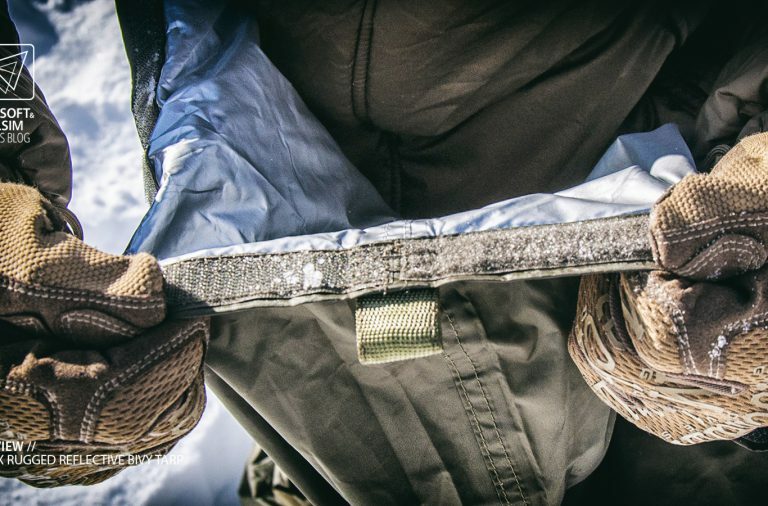 The webbing used for anchor points feels like some heavy duty pack webbing. 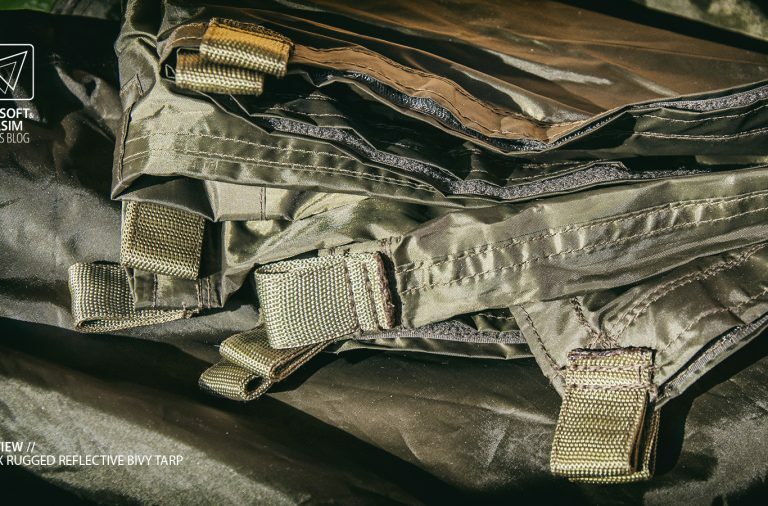 They’re sewn on with a double stitch, so you can securely tie the whole thing down. The PU taped stitches make all the seams waterproof as well. 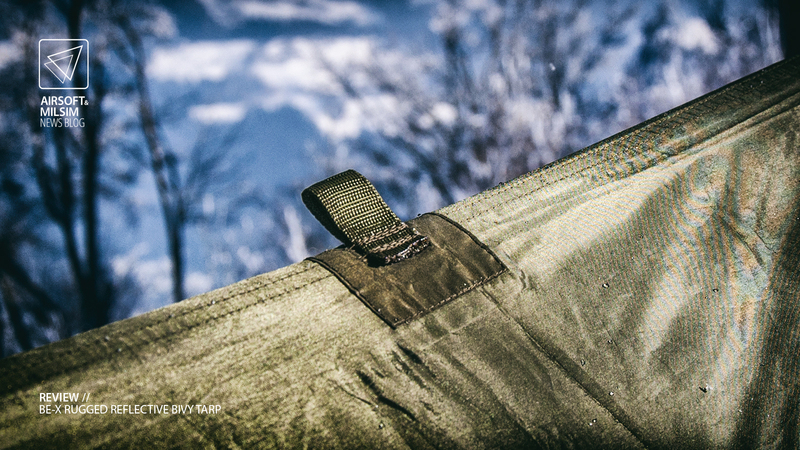 A 10000 mm water column ensures that you and your gear will stay dry. There is no silicone coating present, as requested by military personnel. 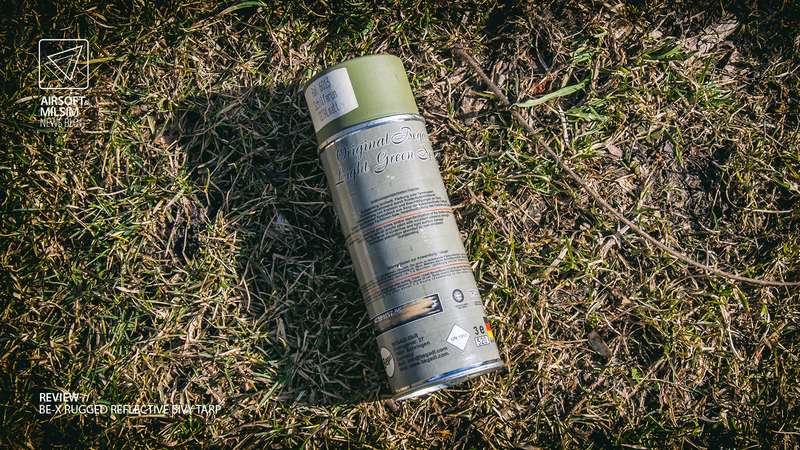 This is important, since the outer (olive) side of the tarp can now be customised with weapon spray paint, to achieve maximum camouflage. 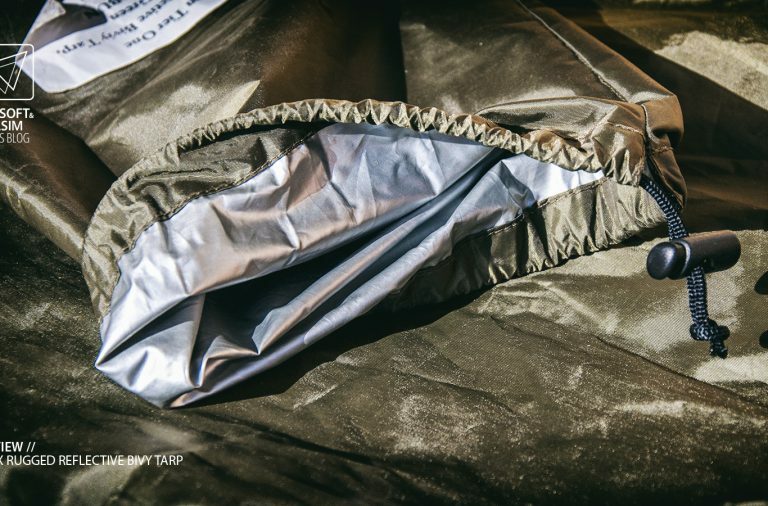 The inner side’s reflective coating serves as a rescue space blanket and so it can be used as such. Assembly is done with great precision. 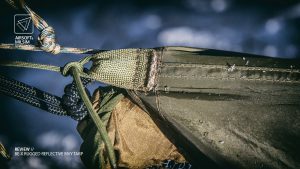 Double stitching on stress points and overlapping fabric you can be sure the shelter will still be there and everything dry underneath, when you return to camp. The only thing i did notice, was a small piece of PU seam sealant tape starting to come off. At least that’s what i thought. After close inspection, i concluded that this is a manufacturing procedure left-over and does not detach from the seam when pulled. The seal also stayed secure and working in heavy rain, so nothing critical. 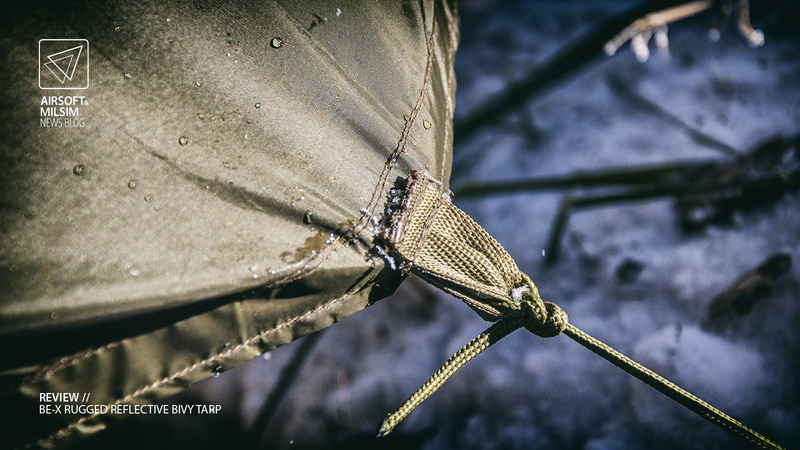 Now i know many of you have previous experiences with some sort of a tarp. 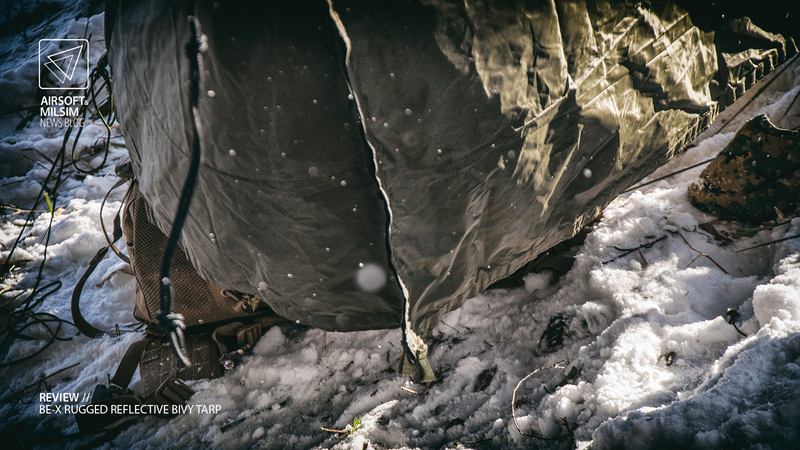 Because of this, we won’t go into details about tarp shelters. 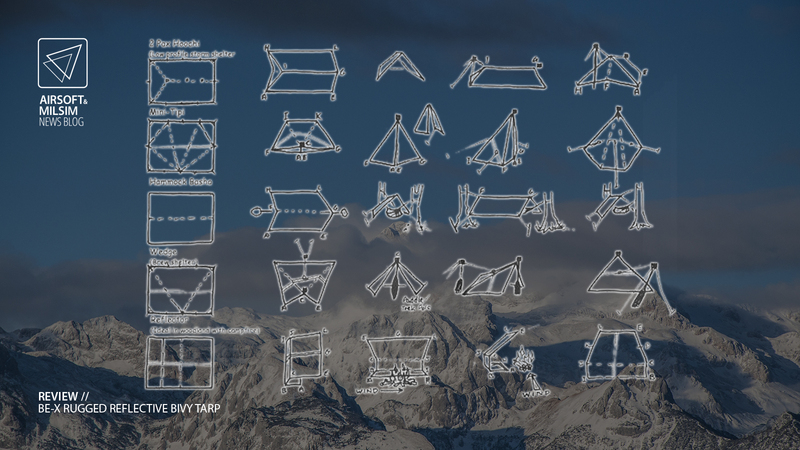 Be it a “lean-to” or an “A-frame”, our guess is you used one of many shelter styles. This tarp can be used for any and all designs and more. 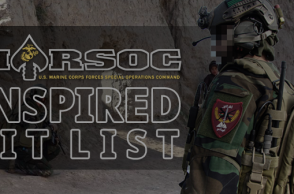 Just for a refresher, here are some of the many variants we found online after a quick search. 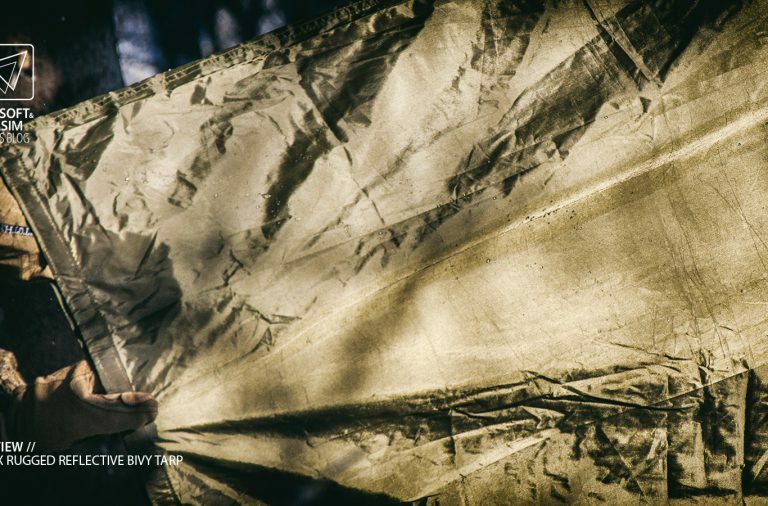 As mentioned, this tarp is not just a tarp. 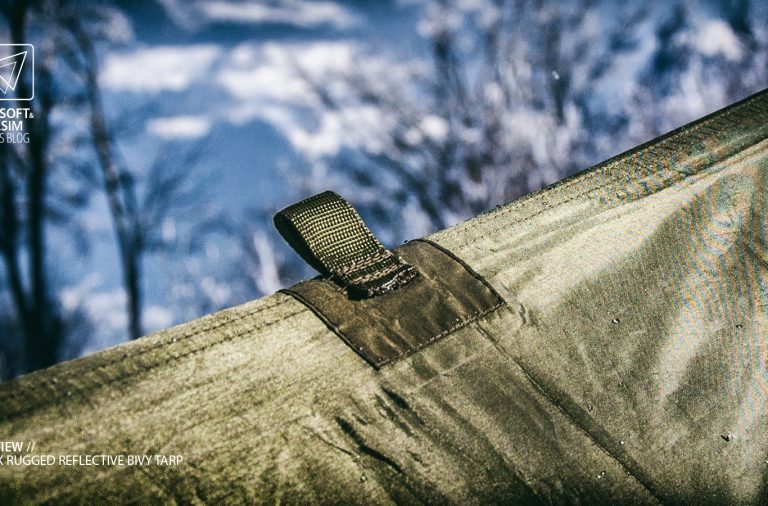 Featuring small game changing details which reflect BEGADI‘s commitment to perfection. Let’s start with the reflective coating. Looking at the previous image, on the bottom you can find an interesting design called “the reflector”. 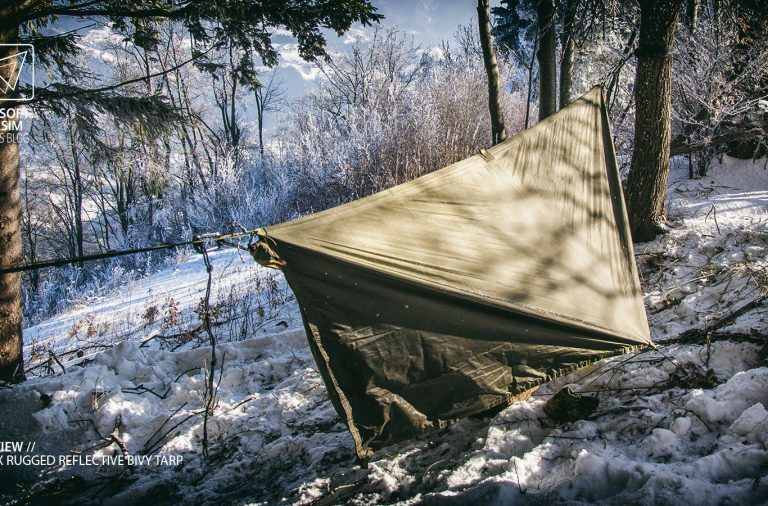 Any tarp can be used like this but with this one, you get the maximum from your camp fire. Placing the shelter so the wind doesn’t blow through the sleeping area, you get a heat radiating wall, which keeps you warm in the harshest of conditions. For longer stays, you might also want to bring some clear PVC foil to suspend between the fire and the sleeping area. Closing this side with this foil will create a green house effect and will keep the shelter warmer, longer. The reflective side shares all the pros of the space blanket. It can be used to prevent body heat loss and if turned around, it can be used as a sun reflecting shade. 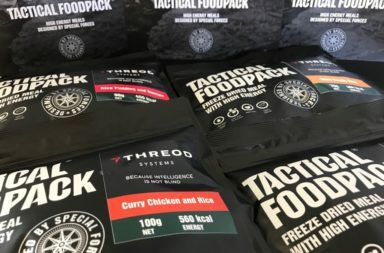 It’s functions are indispensable in any survival situation. 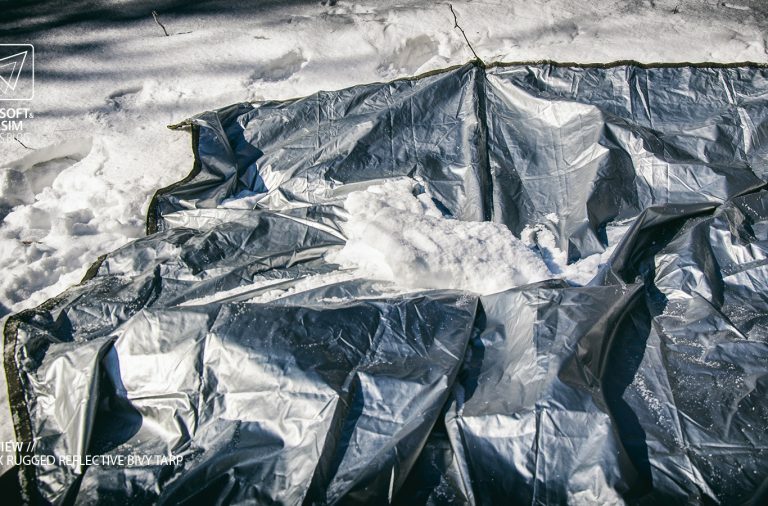 You can also spread it on the ground, reflective side up, to melt snow and take care of water. 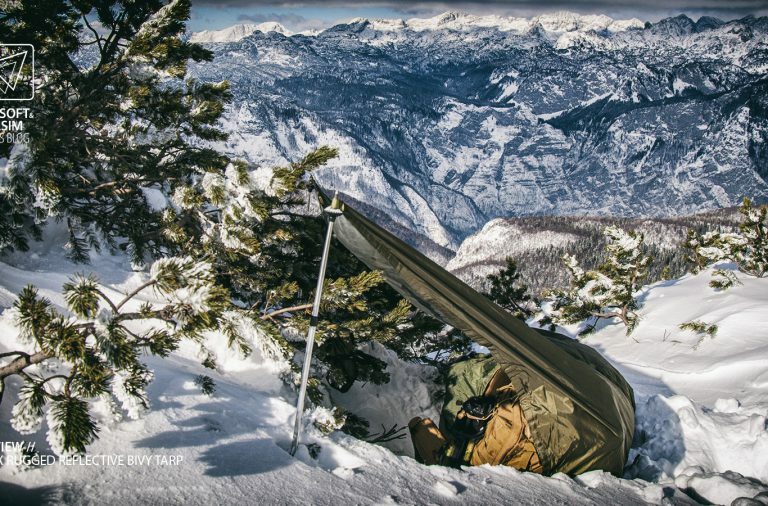 If you don’t need a camouflaged shelter, you can do this while the tarp still functions as a roof. A truly useful feature. 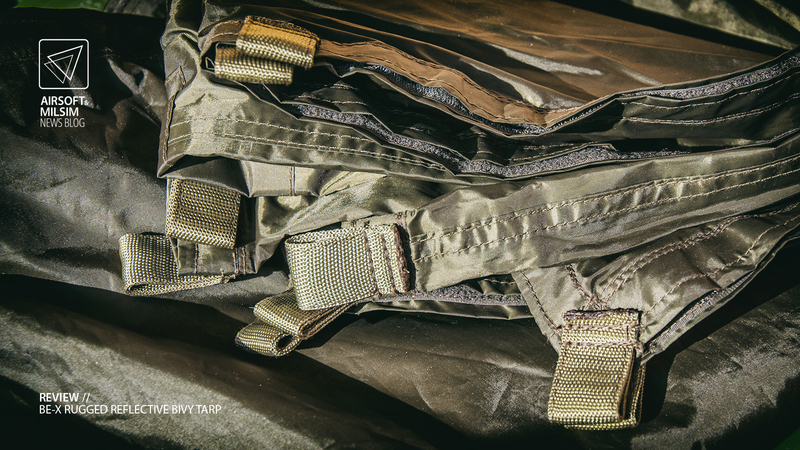 The other side has a nice olive tone to it and a matte finish helps the tarp blend on its own. 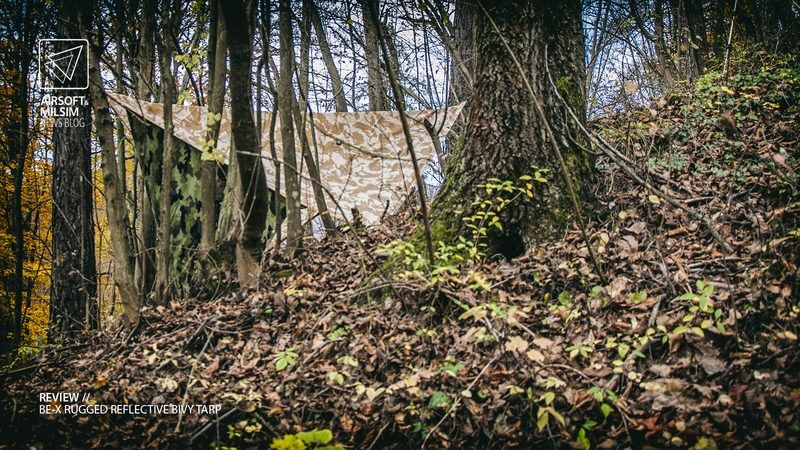 Apply some camouflage netting or paint and you can conceal your position quite nicely. The attachment loops were the only thing i was sceptical about. 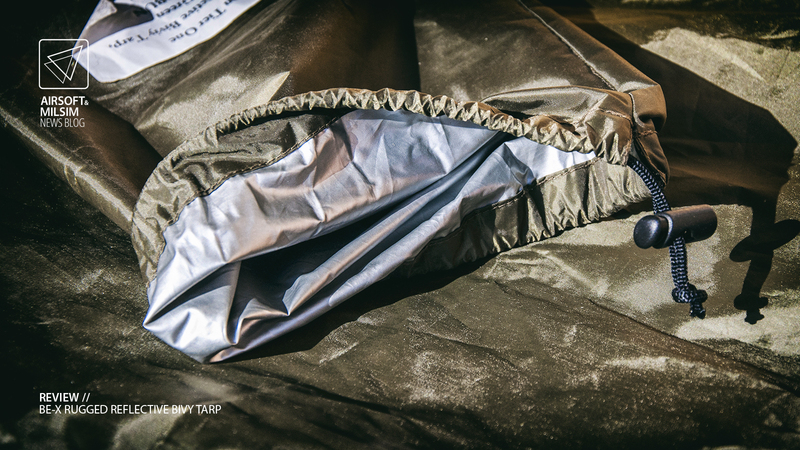 The tarp being so light and thin, i was worried about putting too much tension on them. My fears were quickly vitiated during the first few days of testing. Strong winds and heavy rain forced me to tighten the tarp really hard. No stretch marks or deformations were visible the next day. It definitely is built to the highest standards. The seams and stitches are completely intact to this day. The attachment loops are a perfect feature, as many of other manufacturers like to use steel grommet-ed holes. These rarely stay in the fabric and obviously are made of metal, which means they are not flexible. These fabric loops however, can be twisted, stuffed and generally otherwise deformed to fit your needs. 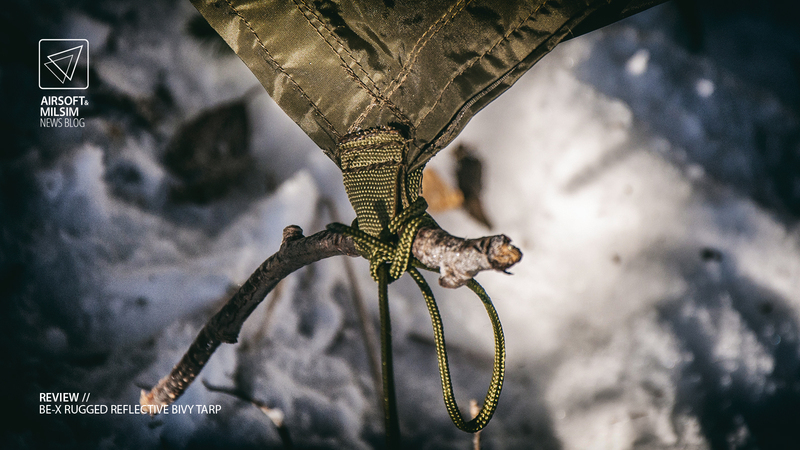 Stick’em on a hiking pole and you have support, without the use of cordage. 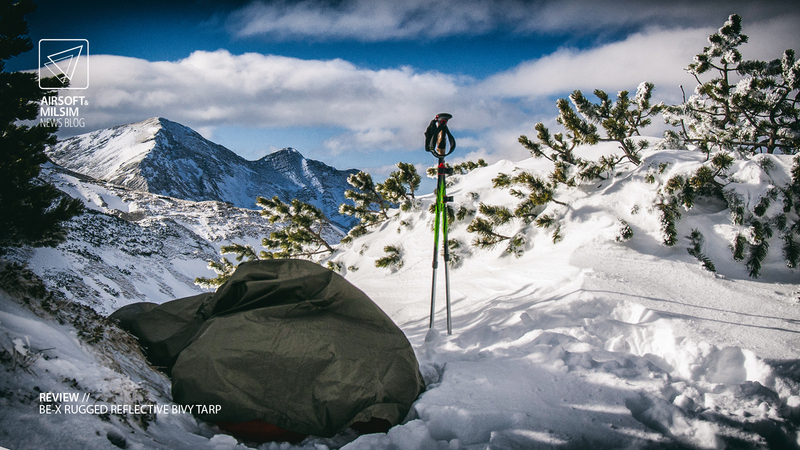 But the hook and loop closure system is the reason why this tarp landed on the top of my “to pack” list. 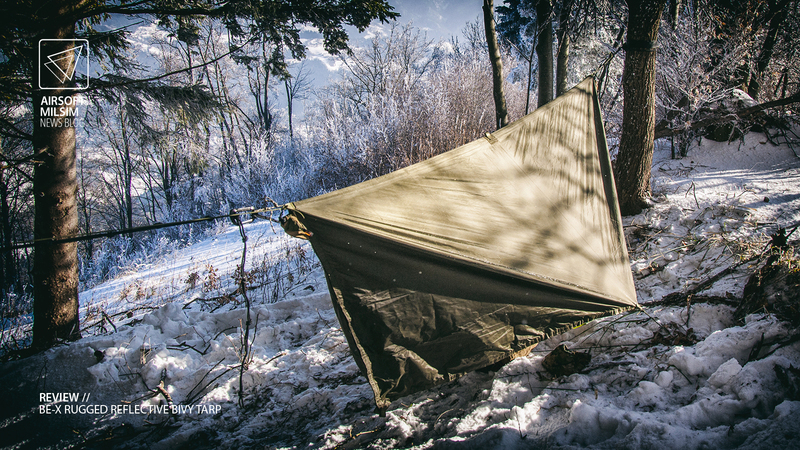 With all the possible uses as a tarp, this one offers even more with less fuss. 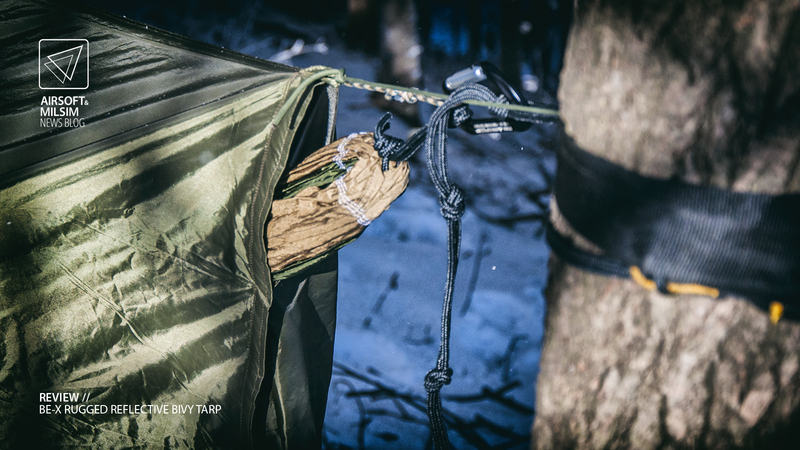 Like mentioned when folded in half, the tarp closes all the way around, thus creating a bivi bag. 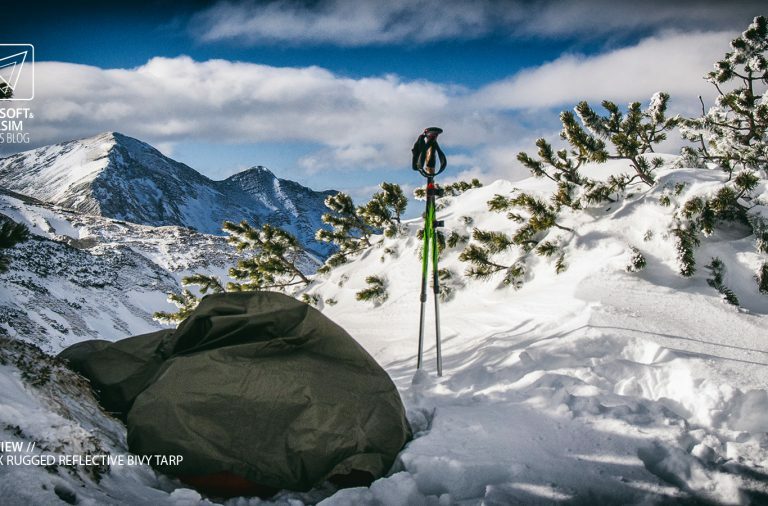 Laying on the ground, sitting or standing, the tarp will do its business. 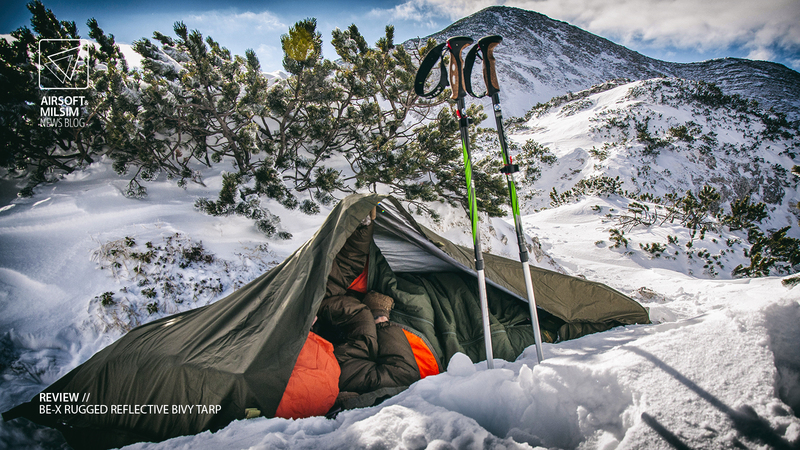 When the weather, time or the activities don’t allow for a pitched tarp shelter, this is the next best thing. 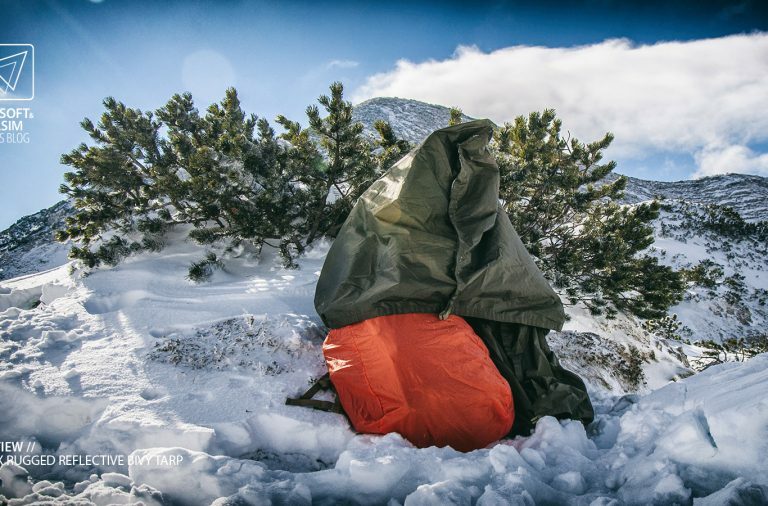 It provides an ultra quick shelter and can be helpful even further. 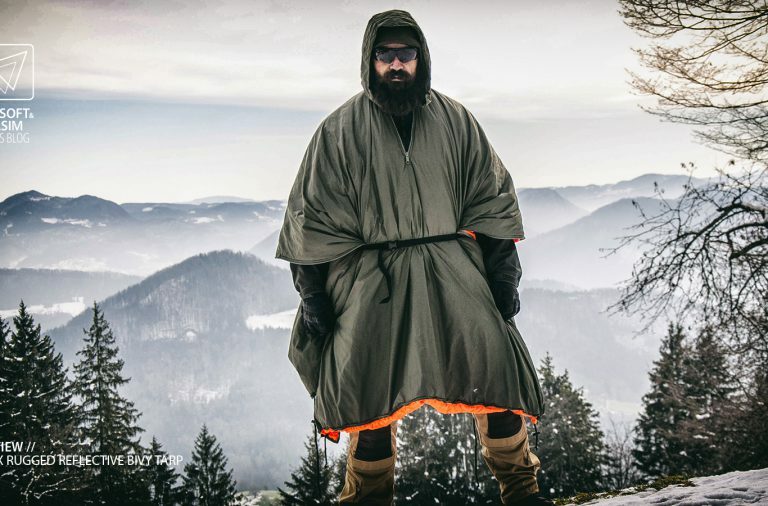 There is enough room for a regular sized person in a sleeping bag, a big backpack and a weapons system or gear. Just lay it on the ground, get in and close the velcro. 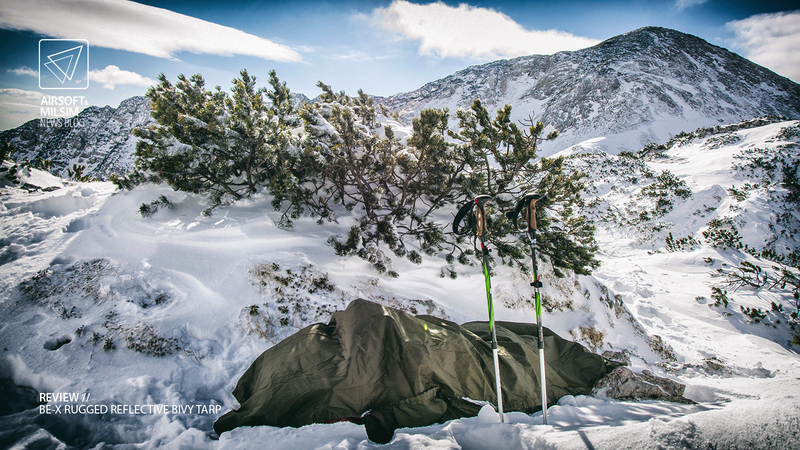 Now you are in a waterproof and windproof shelter, protected from the elements. You can ride out any storm in this setup and still be able to change position. 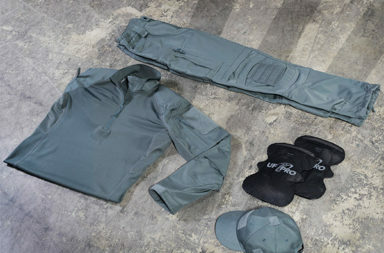 The velcro closure can be undone and adjusted from the inside, allowing you to move and stay dry the whole time. 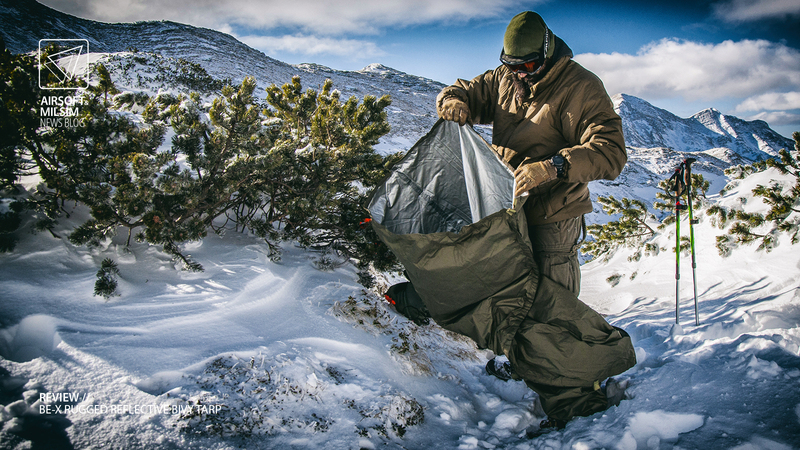 When using this tarp in a combination with the Be-X FronTier One poncho liner, you can stick your feet out and be on the move in seconds. 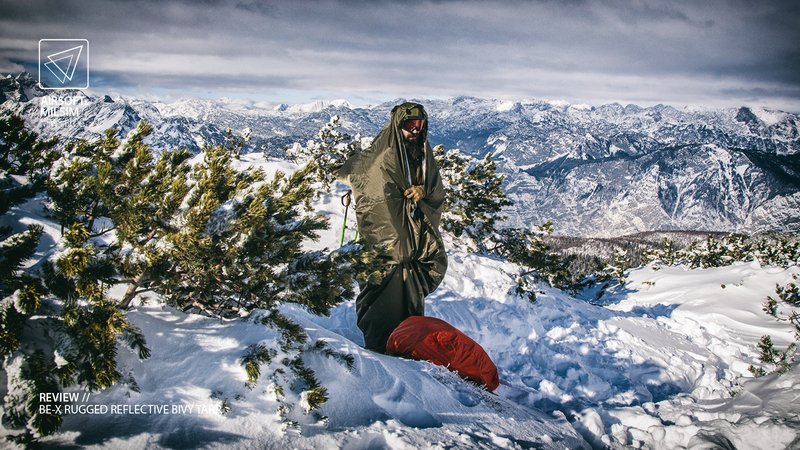 Pro tip: when using the tarp and the poncho liner together correctly, you can stand up and go do your “number one” without leaving the warm bivy sack. Unfortunately a male advantage. 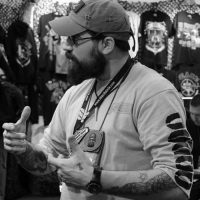 We did a separate review of the liner, so be sure to check that one out as well. Just remember to stick a short branch in between the two closure sides, to allow for light venting. 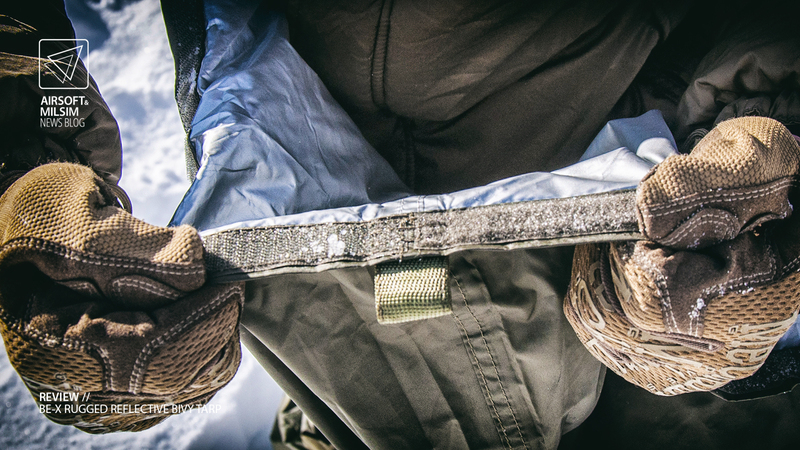 Because of the material being waterproof and closed completely, the sack can feel like being wrapped in a plastic bag. 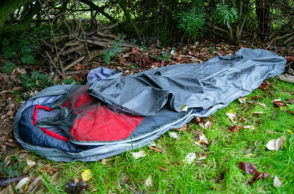 Again on the other hand, this is a good thing, since you are using it partly as a ground sheet, with water flowing underneath and still be dry. With everything being ideal, i still was able to find a small thing that bothered me. Well since it’s not actually the tarp’s fault, but i had to adjust my setup to fit it. Let me explain. 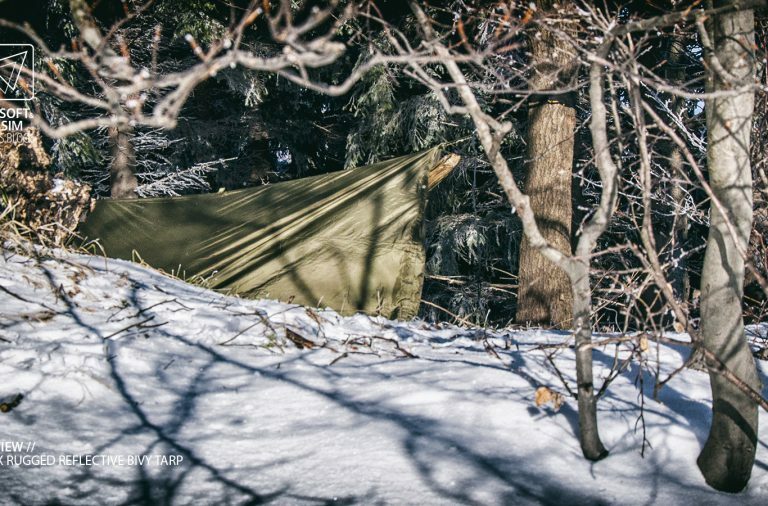 When using the tarp as a hammock basha, i discovered a yet another great feature. 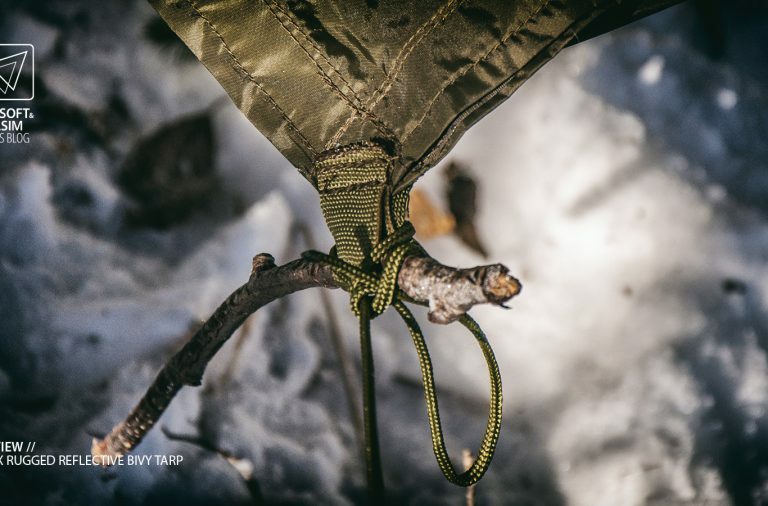 If you suspend the tarp from the middle loops on the shorter sides and tie down only the middle loops of the hanging (long) sides, you can take advantage of the hook and loop closure system. 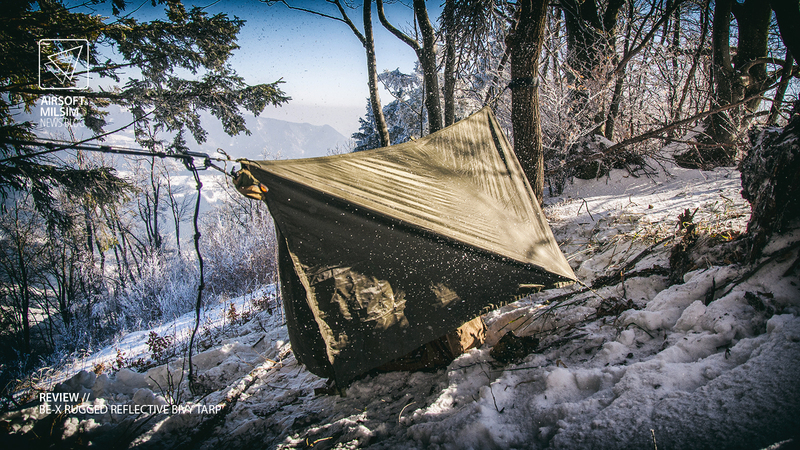 Just stick together the dangling corners and you get a 360° closed shelter, protected against the elements. Now the problem lies in the dimensions. 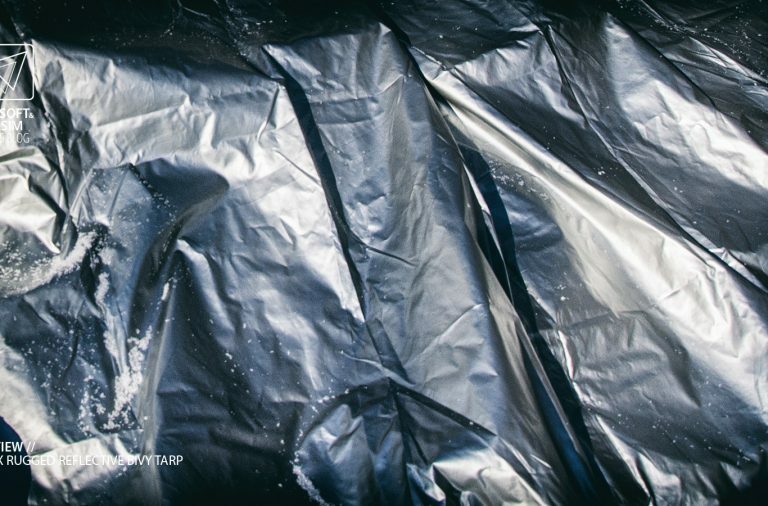 The tarps length is 250 cm. 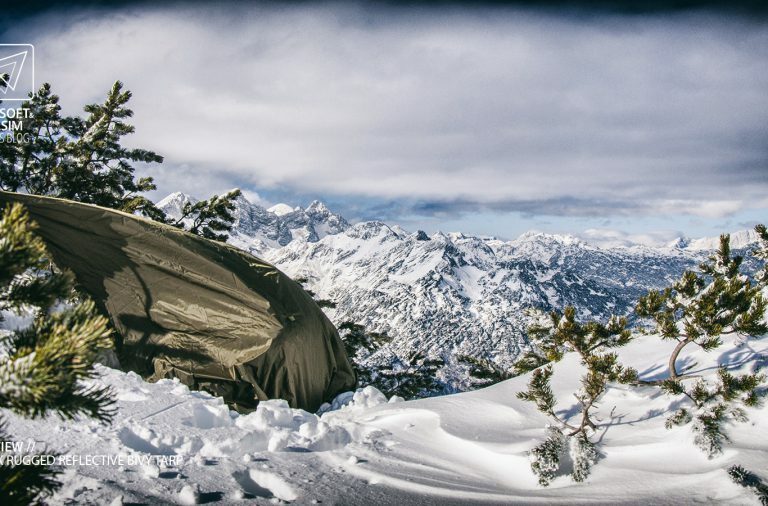 But my hammock ridge line is 285 cm long. 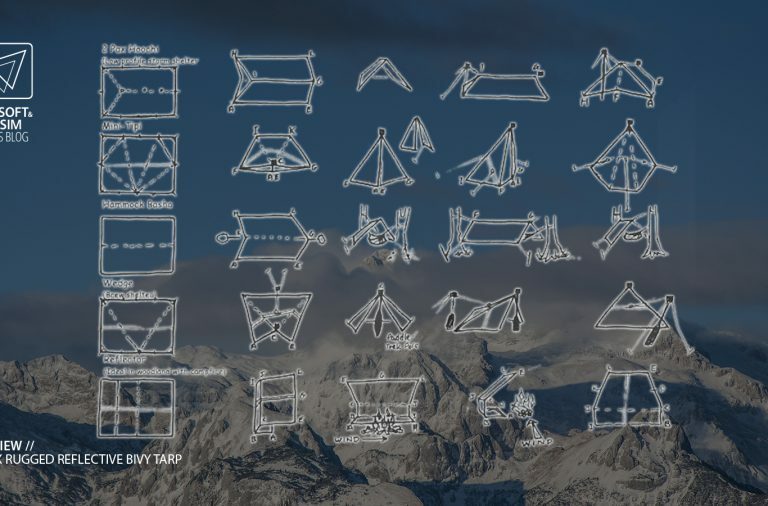 If you are familiar with the point of the ridge line, you might know that it’s length is important, as it helps keep your hammock tension constant. So whenever you hang it, it will always be taut the same and will keep the feel of the hammock the same. 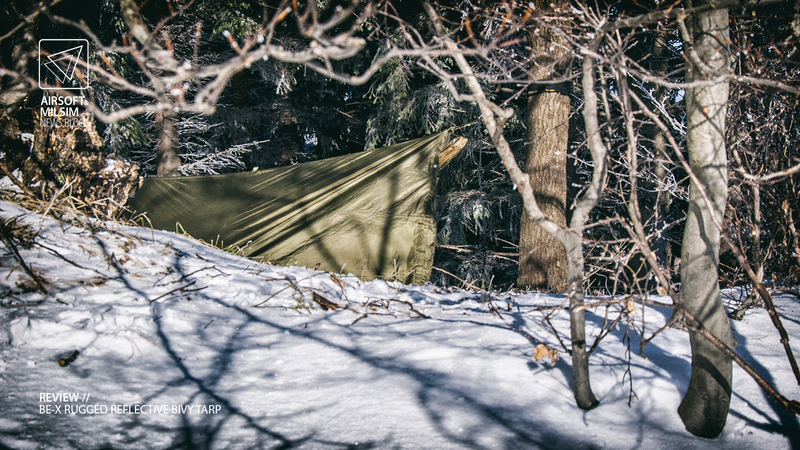 So now we have some 30 cm of hammock sticking out from under the tarp. Not good, for when it rains. This can be avoided by shortening your ridge line. As simple as it sounds, it rarely is. 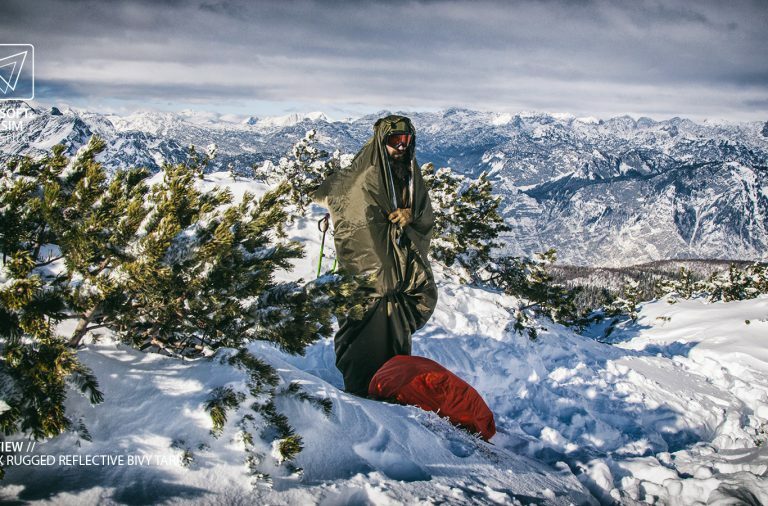 By shortening the ridge line, you create more sag in the hammock, which is not necessarily the worst thing for some people. Even if you can spare those 30 cm because of your hammock design, you still sit lower. So low in fact, that the bottom of the hammock gets in the “breeze zone”. This is the part between the ground and the tarp’s lower edge. It’s necessary for venting and it’s size (height) depends on how high you suspend your setup. 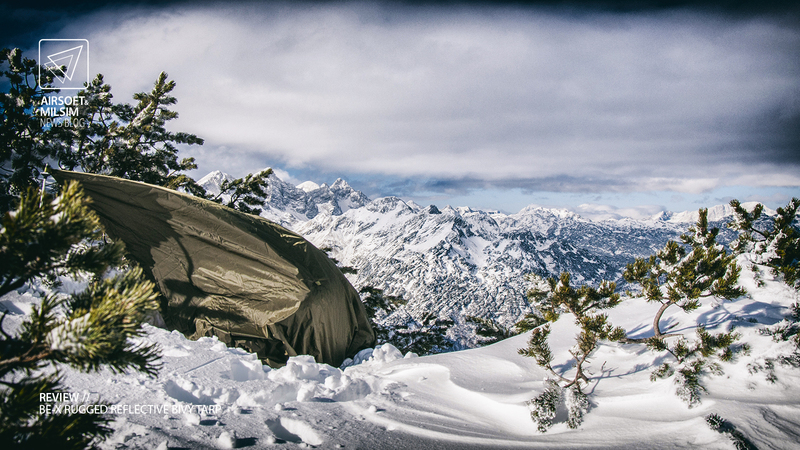 It just takes some thought, when setting up this kind of shelter though. If you take care of the “breeze zone” by carefully choosing your spot, you shouldn’t have any problems with the wind blowing directly across your back. And don’t forget about the reflective side. 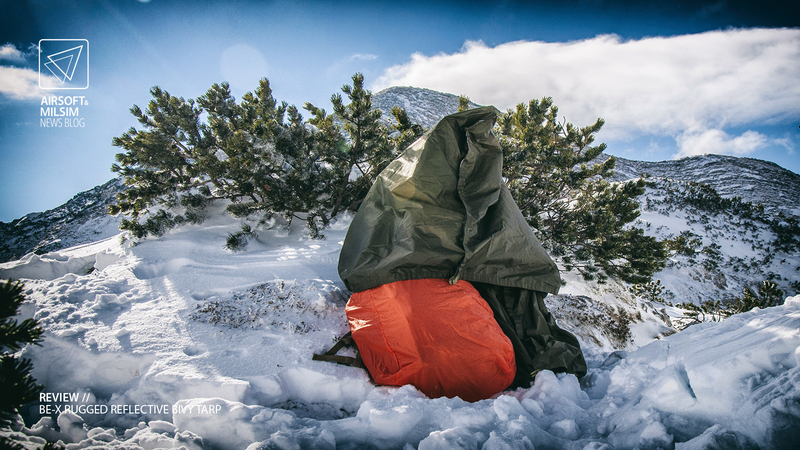 Prepare a small fire away from the sides and gear and it will radiate heat from it all over the shelter. Not the smartest idea, but if you’re careful it can work to your advantage. 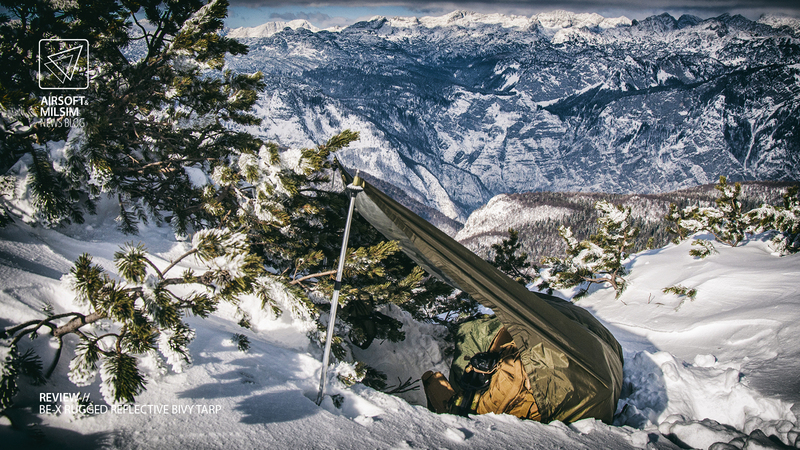 Now i usually use a tarp diagonally, when out and about with a hammock. This way, i have no issues with length. 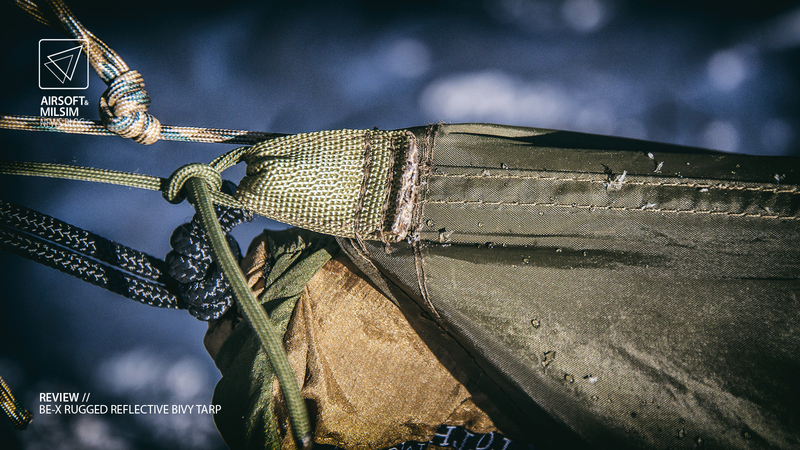 But the hook and loop closure is such a nice feature, it needs to be used. Usually i have to carry two YNA tent wings to achieve this 360° closure. 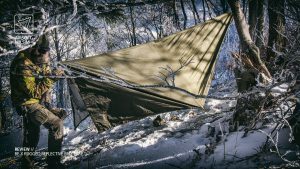 If you are in need of a longer/bigger tarp, be sure to check the BEGADI web site, where they offer their Ranger II, in a reflective edition. Unfortunately without the hook and loop closure, but that can easily be a DIY project. 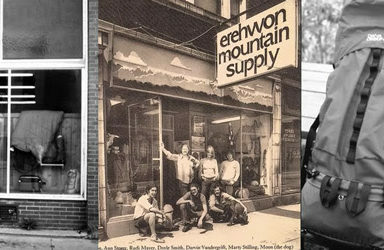 In conclusion, i have only high praise for the item and the company. Their extensive personal testing reflects on this optimised product. A very light, very usable piece of equipment with no pointless features. It defied everything we threw at it and after all the tests, it’s still in like-new condition. 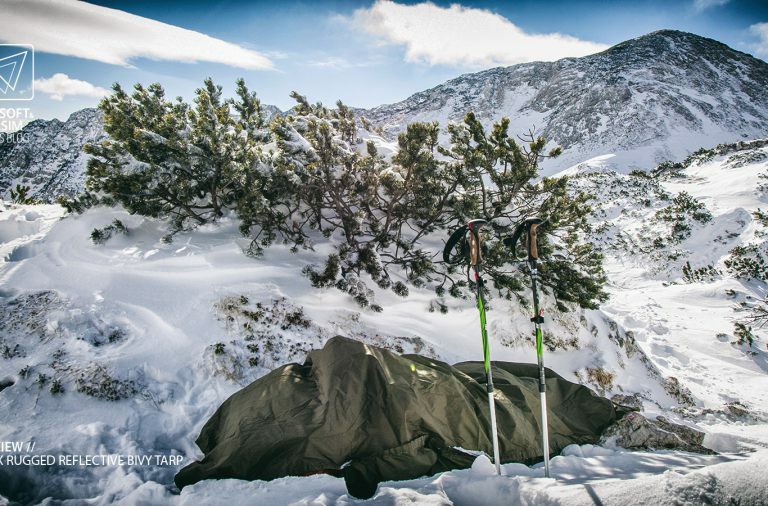 Be it a -15°C snowy mountain or +50°C tropical forest, this tarp can be a life saver.